CWAers Tell Trump: the U.S. Mail is Not for Sale! Local workers and community members, including members of CWA Locals 6450 and 6327, held a "save our jobs" rally outside of Sprint's headquarters in Overland Park, Kan., on Friday morning, to highlight concerns about the proposed T-Mobile/Sprint merger. The rally coincided with a "town hall" event at the headquarters, where T-Mobile CEO John Legere and COO Mike Sievert addressed Sprint employees about the merger. Recent CWA analysis found that 28,000 jobs nationwide, including 4,122 jobs in the Kansas City metro area, are at risk if the Federal Communications Commission and Department of Justice approve the merger without requiring solid and verifiable assurances that the new company will preserve existing jobs and bring offshored work back to the United States. CWA Local 6450 President Sarah Harreus said, "T-Mobile CEO John Legere must listen to this company's workers and Kansas City community members and address our concerns with concrete actions if he wants this merger to go through." "Mergers are supposed to be in the public's interest," said Judy Ancel, an activist from Jobs with Justice. "If this proposed merger goes through as-is, 4,100 people here in Kansas City, and 28,000 nationwide may lose their jobs. Imagine the harm to our community here in Kansas City if 4,100 people lose their jobs." CWA Local 6327 President and CWA National Executive Board member Anetra Session also attended the rally. Local workers and community members, including members of CWA Locals 6450 and 6327, held a "save our jobs" rally outside of Sprint's headquarters in Overland Park, Kan., on Friday morning, to highlight the local and national jobs in the proposed T-Mobile/Sprint merger. 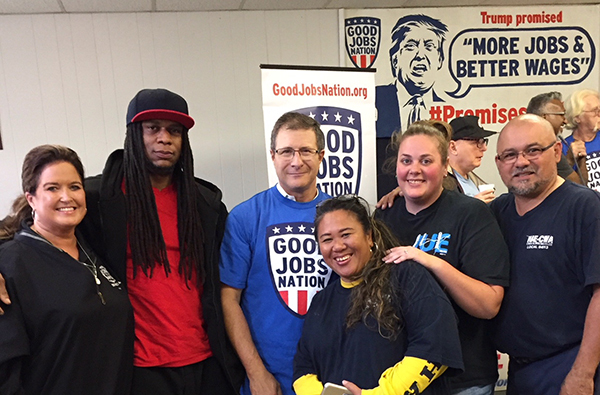 As part of their "Promises Broken" pickup tour, Good Jobs Nation held an event in South Bend, Ind., featuring CWAers at AT&T who are fighting back against the offshoring of U.S. jobs. The pickup tour's goal is to raise public awareness on how, despite his campaign promises, the offshoring of American jobs by U.S. corporations has increased to record levels on President Trump's watch. "I work for AT&T; I'm a former call center worker," said CWA staff representative Jane Phillips. "These are the most retrogressive negotiations we've ever seen. We're asking for AT&T to give us job security. AT&T promised 7,000 good jobs once this tax bill passed. But since the tax cut passed, they have laid off more than 2,500 workers." As part of their "Promises Broken" pickup tour, Good Jobs Nation held an event in South Bend, Ind., featuring CWAers at AT&T who are fighting back against the offshoring of U.S. jobs. The paper's parent company, Omaha-based BH Media Group, is owned by billionaire Warren Buffett's Berkshire Hathaway company. 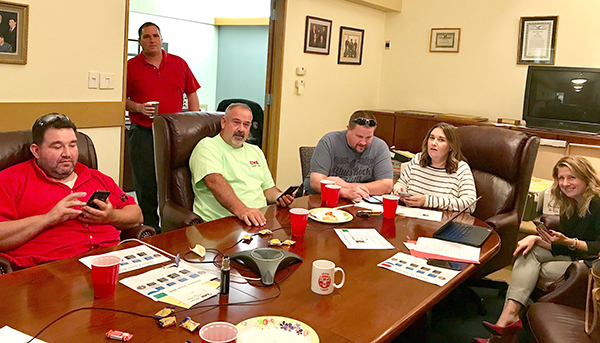 Workers launched their organizing drive to preserve quality journalism and the paper's local flavor amid financial challenges faced by newspapers across the country and in the wake of downsizing in recent months by BH Media. Many newsroom employees have gone ten years with no raises, and more than a dozen were laid off or took early retirement in February and August as part of downsizing by BH Media. 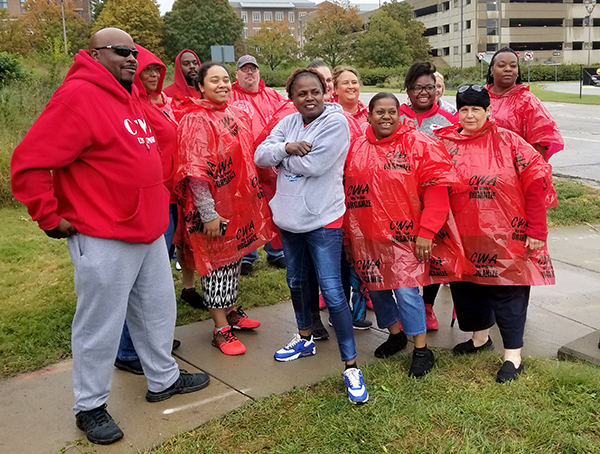 Above: On Saturday, CWA Local 2204 hosted a Labor-to-Labor canvassing event in Roanoke. Participants knocked on union members' doors to talk about the candidates who are best for working people. U.S. 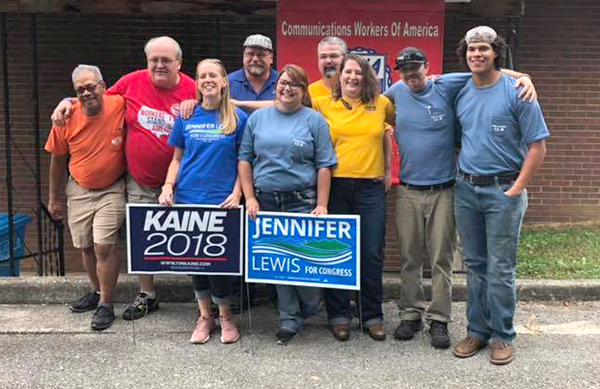 Senator Tim Kaine (D-Va.) and 6th District Democratic congressional candidate Jennifer Lewis rallied with the canvassers before they went out on the canvass. 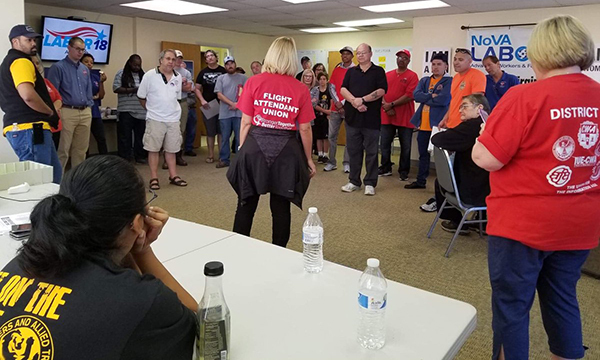 Below: CWAers, including AFA-CWA President Sara Nelson, participated in a Northern Virginia labor walk along with other union members to get out the vote for pro-worker candidates. 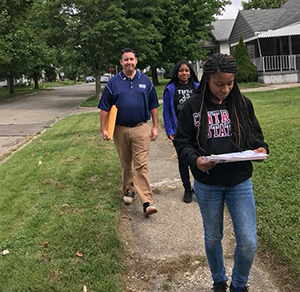 Members of IUE-CWA Local 84755 have been knocking on doors for pro-worker U.S. Senator Sherrod Brown, and for Richard Cordray for Governor and Betty Sutton for Lieutenant Governor. 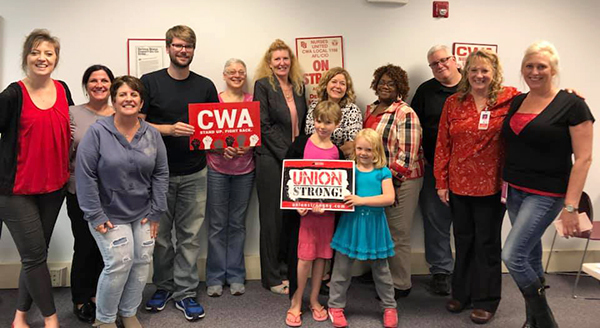 PA CWAers held a "text bank" in Philadelphia on Wednesday to get out the vote for union-strong congressional candidates Conor Lamb, Susan Wild, Matthew Cartwright, and Jess King. 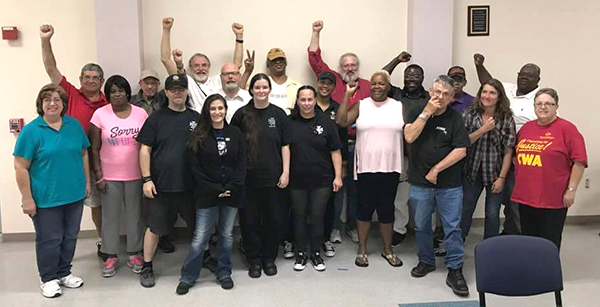 CWAers across New York are going all out to help elect pro-worker candidates like Antonio Delgado for Congress; Jim Gaughran, Anna Kaplan, Senator John Brooks, and Karen Smythe for State Senate; Pat Burke for State Assembly, and more. 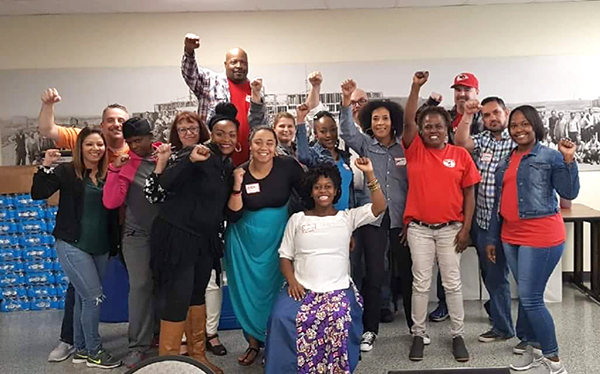 CWA Local 6215 hosted two days of labor-to-labor phone banking in Dallas with 45 volunteers making calls to elect pro-worker candidates Colin Allred for Congress and Nathan Johnson for Texas State Senate. Members of IUE-CWA from across the country gathered in Washington D.C. to meet with Members of Congress and their staff and to ask for support in their efforts to pass two bills: the Workers' Freedom to Negotiate Act and the No Tax Breaks for Outsourcing Act. The Workers' Freedom to Negotiate Act would strengthen workers' freedom to join unions and negotiate collectively to win better pay and conditions, stiffen penalties on corporations who violate labor laws, protect workers' right to strike, and protect the integrity of union elections. The No Tax Breaks for Outsourcing Act would put a stop to harmful provisions of the Republican corporate tax bill that reward and incentivize the offshoring of more American jobs, and ensure that multinational corporations pay the same tax rate on profits earned abroad as they do in the United States. 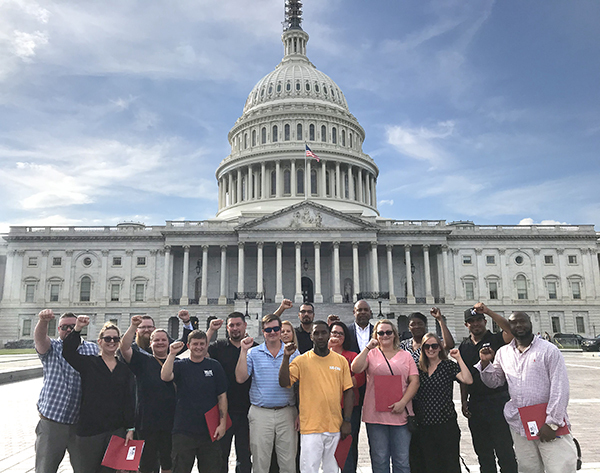 Members of IUE-CWA from across the country gathered in Washington, D.C., to meet with Members of Congress and their staff and to ask for support in their efforts to pass two bills: the Workers' Freedom to Negotiate Act and the No Tax Breaks for Outsourcing Act. 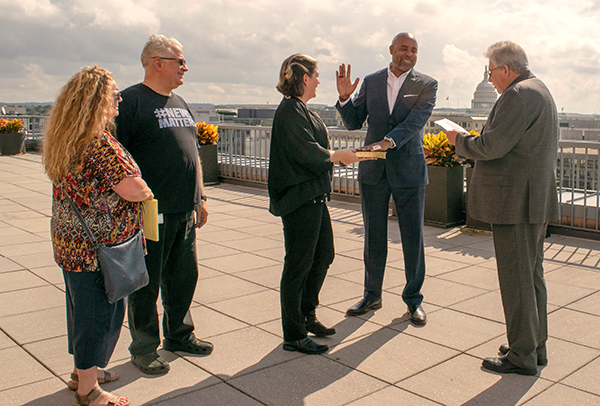 CWA President Chris Shelton administered the Oath of Office to Carl Kennebrew, who joins the CWA Executive Board as the 8th IUE-CWA President. Kennebrew was elected in August after the retirement of James D. Clark. The Canadian Media Guild-CWA Canada is welcoming a $35-million class action lawsuit filed on behalf of hundreds of reality and factual TV workers who have worked at Cineflix Canada, which produces TV shows including Property Brothers and Mayday. "Reality and factual TV are the wild west of the entertainment world," said Lise Lareau, a coordinator of the CMG's Fairness in Factual TV campaign. "People working in this area of production are cut out of labor laws. They don't have the rights of other employees, and historically they've been left out of union contracts enjoyed by the rest of the entertainment industry." Most reality and factual TV production companies make their workers set up their own corporations or sign contracts saying they are "independent contractors" and then don't provide overtime pay, vacation pay, and paid holidays. The failure to pay these basic entitlements is the basis for the class action lawsuit. Learn more and join the Fairness in Factual TV campaign here. On Monday, CWAers joined thousands of postal workers and supporters across the country on a National Day of Action to tell President Trump: the U.S. Mail is Not for Sale! In June, Trump proposed a disastrous plan to "restructure" the U.S. Postal Service and "prepare it for future conversion from a government agency into a privately-held corporation." "Corporate greed has no boundaries," said CWA Local 1400 President Don Trementozzi at a rally in Portsmouth which was covered by the New Hampshire Union Leader. "This is a corporate scam. This is nothing more than the Trump administration trying to give his friends a fire sale (of assets) at the post office." A large, bipartisan group of legislators in the U.S. House and Senate have already signaled their support for a resolution to ensure that the United States Postal Service remains an independent establishment of the Federal Government and not be subject to privatization. CWAers, including members of CWA Local 1400, the CWA Arizona Retired Members Council, and AFA-CWA rallied at events across the country with postal workers to tell President Trump: the U.S. Mail is Not for Sale!